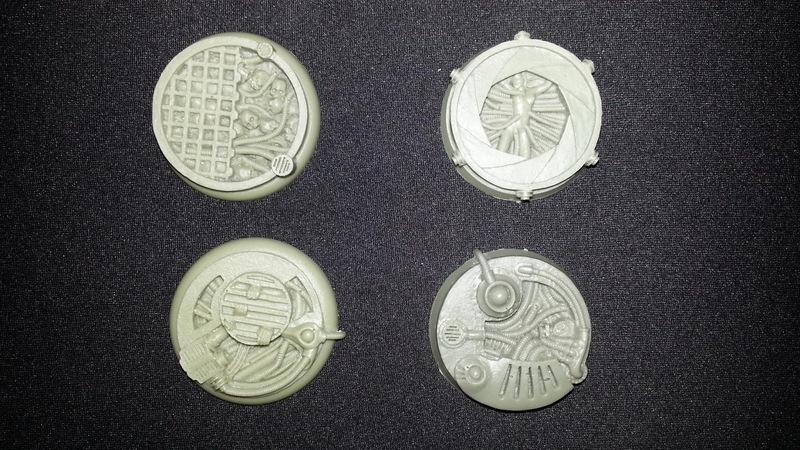 The Basicks company is selling lots of accessories for wargames’ fans, including a large number of battle bases. Today I wanted to make some comments on one of my favorites, BioTech. 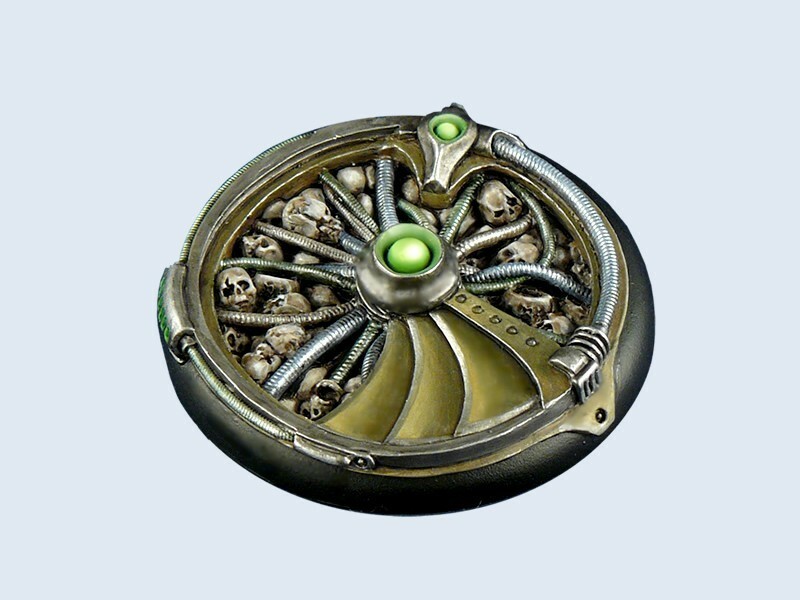 I've seen many examples of different designs for miniature bases, and those I discuss today are certainly in my personal top ten. Their designs are complex and interesting, not boring, and they do not use the same themes too often. Furthermore, each of them can be a real challenge for your painting skills. The Basicks company has provided me with some Battle Bases from the BioTech series. 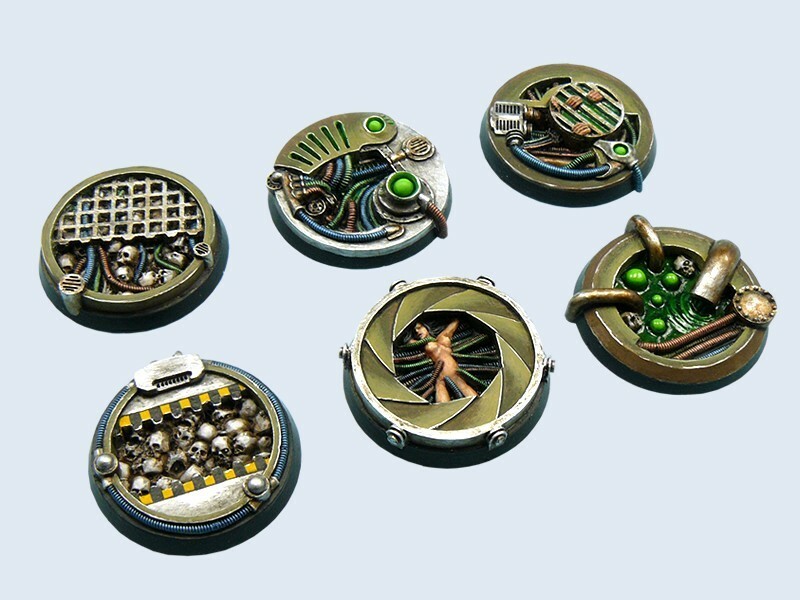 There are four different designs with a diameter of 40 mm, and one of 50 millimeters. Those bases are larger than a standard miniature base (25mm) and are best suited for larger models. However, they are also great for smaller, major models (generals, heroes, champions), because you can change them into little dioramas, adding different elements, such as another miniature or a dead enemy's body. 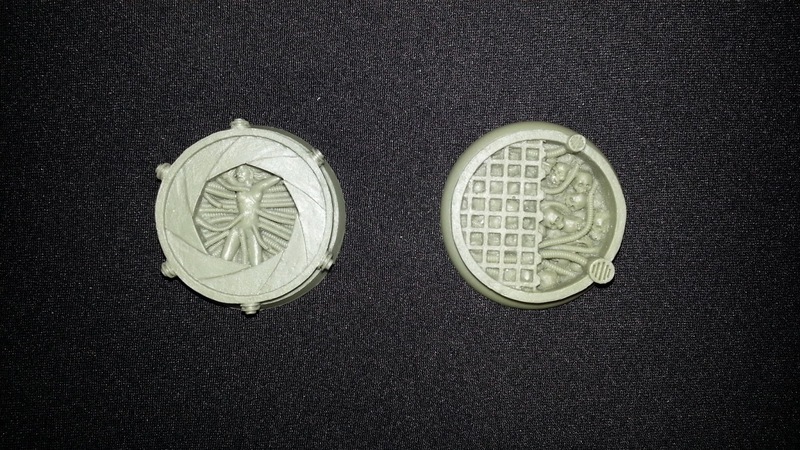 Those bases perfectly fit the mood of the Ridley Scot films, and are perfect for Warhammer 40,000 Necrons army or Space Hulk miniatures. The common themes include skulls, wires, strange liquids, and a variety of mechanical and electronic elements combined with the human body (like servitors). The first 40 mm base resembles a hole or a tube filled with skulls almost to the brim. Between the bones the cables are “writhing” under and above them, part of the skulls (roughly half the base) are encased with metal bars on top. The Second base is more abstract. In the recess there is a tangle of cables, which are connected to the more protruding, technical elements. The whole base resembles some strange unknown device serving some surely disturbing function, and it looks quite intimidating. Another base is an interesting piece, because its central element is a human body. The Main outer part of the base resembles a lens, a bit those like in an old camera, or some cyberpunk bionic eye. The figure is shown in movement, the mechanism is closing or opening and we can see the scene at the bottom. Here we can see a figure of a naked, defenseless woman connected to dozens of cables. 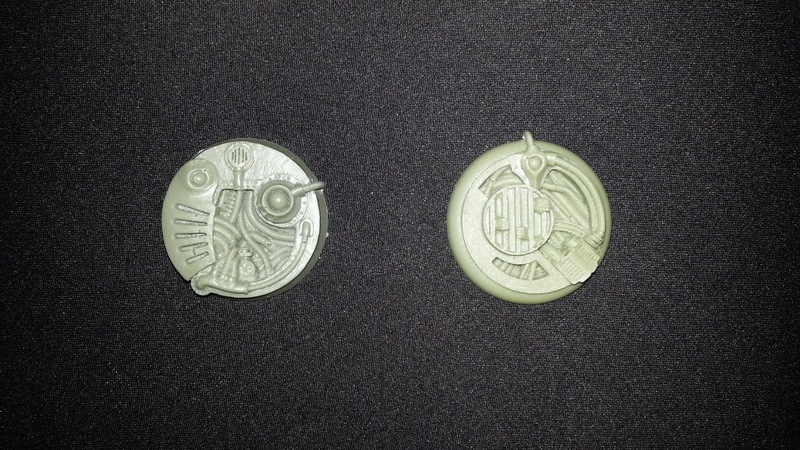 The last of the 40 mm bases also includes "human" motives. Among the tangle of tubes and cables there is a mechanism that looks a bit like sewage pit covered with bars. In between these metal bars there are human hands protruding above the liquid in which they their bodies are immersed, desperately trying to get a grip on metal bars and to pull themselves out. 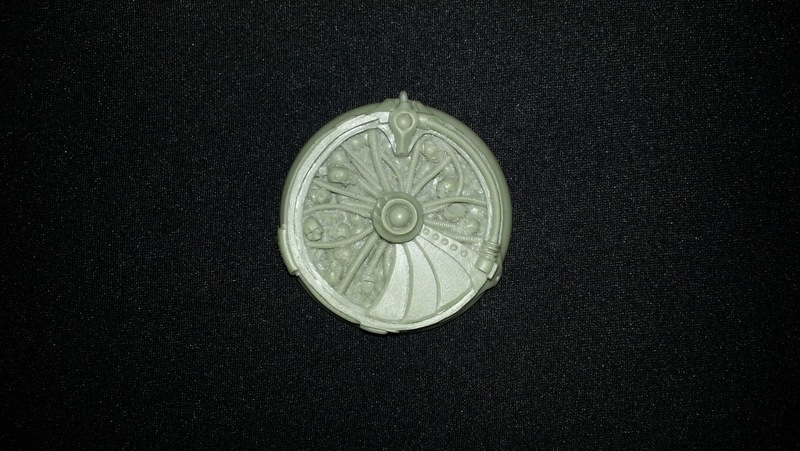 The 50 mm battle base is similar to its smaller counterparts. There are lots of skulls and split cables. Some of the skulls are covered with a sliding metal shielding. Cables of different thickness also appear on the outside, surrounding the entire base. I loved all of these BioTech patterns. They evoke feelings of anxiety by combining biological and mechanical components, which are also skillfully balanced. I also like that each of the bases has two levels of carvings and components, which are placed both deep inside the base as wells as on the top. It gives a great feeling of depth. Thus we have the impression that what we see is only part of a larger machine reaching deep into the ground. High level of detail which is characteristic to all BioTech bases can sometimes be disadvantage. In connection with such a large number of small parts and details, there can be some miscasts. Sometimes we can see some imperfections in the casting. There can be resin bubbles in the sockets of skulls or small holes in the cables. All of these drawbacks, however, are so small that they can be successfully repaired quickly with little greenstuff. On the other hand, you can leave them be and while painting you can present it as damaged mechanisms.